This is what one girl did. “The Department of Philosophy at the University of Otago is pleased to announce their development of a Philosophy subject database for the HMP mobile app which launches internationally today. HelpMePublish is a ‘crowdsourced’ database listing over 5300 academic journals in 13 subject areas. The database displays live data as it is contributed by journal editors (including acceptance rates and refereeing policies) and academics via the app’s built-in journal rating questionnaire. We’ve built it, but if HelpMePublish is to be a valuable resource for the research community, we need you to contribute your experience as a publishing researcher. You are permitted one submission, unless you are submitting a poster. If you are submitting a poster, you can additionally submit an abstract for a paper, panel, or workshop. To submit please go to https://www.easychair.org/conferences/?conf=stg2013 and sign up for an account. If you have questions, email science.technology.gender@gmail.com. · Panels: Please provide a title, 300-word abstract, and 3-10 keywords for the panel as a whole. Also, upload a single document that includes the title and 300-word abstract for each paper. Please take care not to identify authors. · Workshops: Please provide a title, 300-word abstract describing the workshop rationale, and 3-10 keywords. Also, upload a 300-word description of the activities in which your audience will engage. Please take care not to identify authors. This conference will be held in conjunction with FEMMSS5. 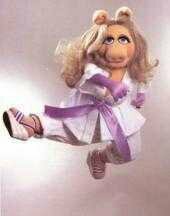 Is Miss Piggy a Feminist Icon? See the arguments in favour at Fit, Feminist, and (Almost) Fifty. Cato Taylor is a PhD student at the University of Alberta and she covers lots of turf, including fatness, fashion, and being a woman of colour in Philosophy. Here’s her terrific, articulate response to being asked about often being the only one of her kind in the discipline, like being a unicorn. The strongest graduate paper will receive a modest cash award from the Duquesne Women in Philosophy. We are an active group of female philosophy graduate students who are striving to improve the status of women in philosophy. See A Map of the Gender Gap in Science Around the Globe: A portrait from UNESCO shows where women are well represented among employed scientists, and where they are rare. For a good discussion of the issues how it connects to epistemic injustice read Why Women Are Not Taken Seriously in Sports Conversations and What We Can Do About It at the Huffington Post here. Margreet de Heers’ philosophy comic book is reviewed by Suzette Chan at Sequential Tart here. Philosophy can sometimes be presented as dogma, removing the pursuit from real lives and preserving it in the ivory tower. 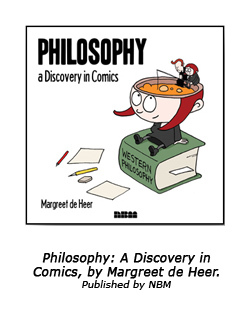 Refreshingly, Margreet de Heer’s graphic novel Philosophy: A Discovery in Comics (published by NMB), characterizes philosophy as a process, not a product. De Heer leads readers through the book with questions such as “What is thinking?” and “What is reality?” — questions that she began to ask when she was a child. Personalizing the questions reminds us of how philosophy is rooted in our curiosity about the universe, and also creates the feeling that we are companions in this enterprise. Visit Margreet de Heer’s website here.